The interior of the Prius Prime is dominated by the available 11.6-inch HD multimedia touchscreen which lets you swipe and pinch your way through the features. Customizable screens include Energy Monitor, Hybrid System and Climate Control Indicator, along with a suite of “Eco” features that add both fun and utility to the driving experience: Eco Score, Eco Savings Record, Drive Monitor, and Eco Diary. More displays include driver support systems, audio system content, and navigation system content. The nav system in particular is impressive on the huge screen. The Prius is built for four passengers instead of five, so that may influence the choice for some consumers. The four-seat cabin layout features a center console in both front and back with standard 60/40 folding rear seatbacks. Overall the interior is very sleek and comfortable. 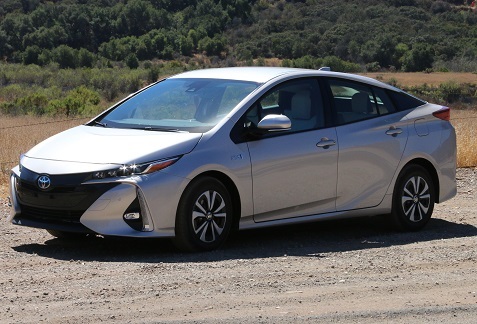 You don’t think of performance with you hear the Prius name, but I was very impressed with the handling and acceleration of the new Prius Prime when testing it on a wide variety of roads, including some challenging mountain roads. Having a Sport mode option certainly helps when you need extra acceleration. Just drive this vehicle and you’ll let go of any preconceived notions you have about a Prius. While consumers will likely enjoy the driving experience with the Prime, the hybrid features still provide the main attraction, and Toyota keeps improving those features. With the Prime, you can plug in and charge the vehicle with a standard household outlet – no additional equipment is needed. That process takes 5 ½ hours, while using public charge or a 240V charger lets you charge the vehicle in just over two hours. Drivers can choose between pure EV Mode or hybrid power. Estimated range in just EV Mode gets you 25 miles of range, so some drivers can go for months without buying gas if they have a short commute. The Prime achieves projected EPA-estimated 124 MPGe (miles per gallon equivalent) which is class-leading for a plug-in hybrid. In hybrid mode, the Prius Prime provides a class-leading projected EPA-estimated 55 city/53 highway/54 combined MPG. The Prius Prime can also optimize range by memorizing a driver’s stopping patterns on frequently driven routes and suggesting when to let off the accelerator. This options includes Predictive Efficient Drive with Predictive Deceleration Support that collects daily driving data to predict points of deceleration and stopping. With this information, when the driver goes through a location in the database, the system indicates when to let off the accelerator and can apply assisted deceleration to help boost fuel efficiency. With low gas prices, sales of the Prius have lagged a bit over the past year, but we all know that gas prices are hard to predict. For consumers who care about a green lifestyle or are interested in the federal tax incentives, the Prius remains one of those products that will get serious consideration. With the new design, they may also start expanding the types of consumers who will be drawn to this model, particularly if those consumers attracted by the more aggressive design decide to test-drive the Prime as well.